I am pedantic, opinionated, but not always consistent. I needed to start with that statement, due to my earlier post about cocktails. In that article I made it clear that any deviation from the one true way of making a Martini was a heresy. This post is about the Old Fashioned, another classic cocktail. I will argue that its great strength is the endless variations that can be applied to the basic formula. The Martini is inviolate; the Old Fashioned an opportunity for experimentation. The Old Fashioned did not always bear that name. It was originally known simply as the Cocktail, before that term came to be applied to any mixed drink with hard alcohol. It shares with the Martini, the honor of having a glass named after it. The Old Fashioned glass is a short tumbler also known as a rocks glass or a lowball glass. Note that there is no use of soda water nor adding a pile of fruit. The Old Fashioned is flexible, but must remain a heavily spirited drink. I generally do not use a sugar-cube, but substitute simple syrup; which reduced the time that it takes to make. The sweetener is the first ingredient that can be changed with interesting impact. I have used honey, agave syrup, dark sugar syrup, and maple syrup. The last of these is my favorite as it adds flavour as well as sweetness to the drink. There is no need to stick to Rye, or even Whiskey for an Old Fashioned. Brandy, dark Rum, or aged Tequila work well. In fact there are parts of the mid-Western US where the default spirit for an Old-Fashioned is Brandy. The third ingredient is also open for experimentation. I like to use chocolate bitters with Anjeo Tequila. I have found cardamom bitters complement both Rum and Bourbon. In a recent trip to Napa Valley Distillery , I purchased some Brandy Old Fashioned Bitters from Dashfire. Whilst these are clearly intended for use in a Brandy Old Fashioned, they also work well with Rye and Maple Syrup. The final variation that helps in making an Old Fashioned is to replace regular ice-cubes with a single large lump of ice; this melts more slowly in the glass and reduces dilution of the drink. Since this a cocktail to sip, keeping the drink from watering down too quickly is an important consideration. I also think that there is a visual appeal to a single lump of ice, especially one that is clear and not cloudy. 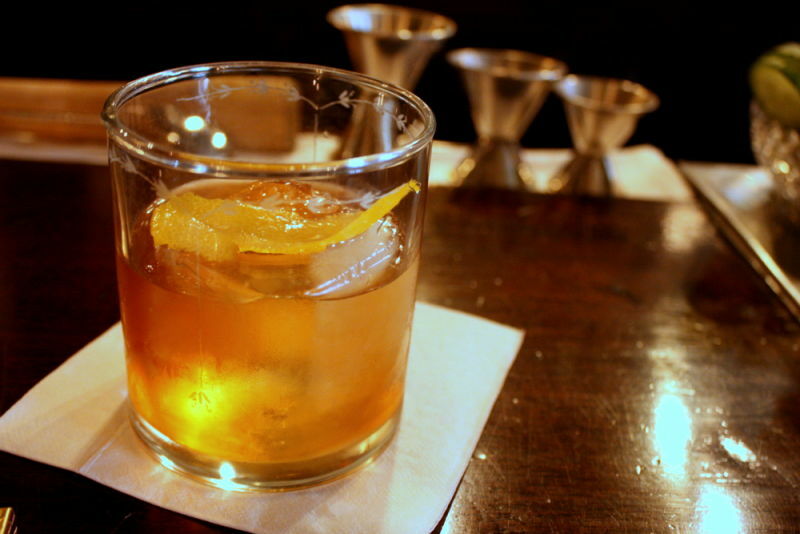 The Old Fashioned, despite its name is a drink that truly rewards experimentation. There are limits to that flexibility, apart from the aforementioned ban on soda water and fruit cocktails, adding Absinthe makes it an entirely different drink. It is an Old-Fashioned as long as you have brown spirit, sweetener, bitters, ice, and at most a single piece of fruit peel as garnish. I had no idea how many ways you could change up an Old Fashioned and am especially intrigued by the maple syrup option! Thanks for sharing this.